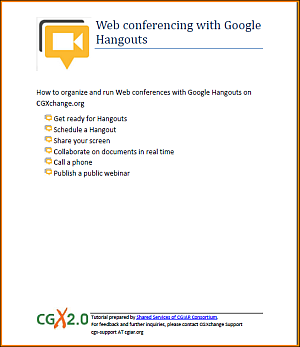 A new tutorial on how to organize and run Web conferences with Hangouts on CGXchange.org is now available. Over the last few months, we have received many requests for guidance on how to use Hangouts. Since the new Google+-based video call service has been enabled, it has clearly emerged as an alternative to other web conferencing tools (e.g. Skype, Webex). - Are required to record online meetings for sharing with colleagues at a later time (only for public dissemination). - Sharing public webinars on YouTube in real time or for later viewing. Check out how to get started with Hangouts on CGXchange.org and download the tutorial.